How Long Does It Take to Become a Court Reporter in Washington? How Much Do Court Reporters Make in Washington? There is a reason why court reporters are called “Guardians of the Record”. They create a permanent record of everything that is spoken. This is done for the sake of reference in the future. In legal settings, verbatim transcripts prepared by court reporters are used by judges, attorneys, witnesses and juries. The record produced by court reporters is not only helpful during a trial but also during the appeal stage. 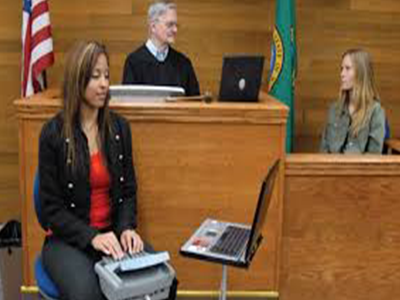 Court reporters thus play a pivotal role in the justice system. Such an important profession is therefore regulated all across the United States. Though requirements may vary from state to state, most, if not all, now require post high school education and license and/or certification to apply for a court reporter’s position. If you live in the state of Washington and are wondering how to become a court reporter in Washington then continue reading. The good news is that the state of Washington doesn’t require a college level education to become a court reporter. So, in theory you can become a court reporter with a high school diploma or GED. However, in reality, you need to get certified (a mandatory requirement) in order to work as a court reporter in Washington. To get certified, you would need to pass the state’s court reporter exam and the skills needed to pass this exam are taught in technical institutes or community colleges. It is therefore advised that after graduating from high school, you consider enrolling in your local community college’s court reporting program. You may enroll yourself in a court reporting certificate, diploma or associate degree program. Whichever path you choose, make sure it prepares you well to get certified as that is the only mandatory requirement to become a court reporter in Washington. Pass the Washington State court reporter exam – To take this exam, you will need to complete and file Court Reporter Certification Application with the Washington State Department of Licensing. Apply using the National Court Reporters Association designation – This is for those who already hold a certification from NCRA. To avail this option, you will have to file Court Reporter Certification Application with the Washington State Department of Licensing. Apply using the National Stenomask Verbatim Reporters Association designation – This is for those who already hold a certification from this association. To avail this option, you will have to file Court Reporter Certification Application with the Washington State Department of Licensing. If you are a certified court reporter from another state then you can apply using reciprocity. To avail this option, you will have to file Court Reporter Certification Application with the Washington State Department of Licensing along with a copy of your current license and proof that you’ve passed an exam that exceeds or at least meets Washington State standards. Once you are certified you can begin looking for a court reporter’s job in the state. You can begin your search by visiting the Washington Court Reporters Association (WCRA) website, where under “Education & Careers”, click on “Job Openings”. It may take you two or more years to complete your post high school qualifications. Then getting certified may take another few months. The real challenge is however in finding the right job, which may take months, if not a year. All in all, you are looking for a considerable time investment in becoming a court reporter in Washington. According to the US Bureau of Labor Statistics (BLS) May 2017 figures, court reporters in Washington earned the annual mean income of $56,040. According to the US Bureau of Labor Statistics (BLS) May 2017 figures, there were 210 court reporters working in Washington. Court reporters’ jobs nationally are expected to grow at the rate of 3 percent between 2016 and 2026.